Kenya's Masai Mara offers the thrill of the wild and much more! 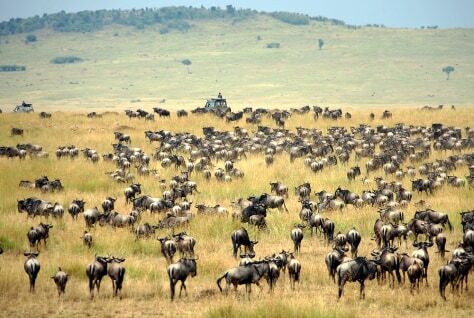 Tourists pass in vehicle (background) between a wildebeest herd during the annual wildebeest migration in Kenya's Masai Mara national reserve, 270 km (165 miles) southwest of capital Nairobi, July 28, 2005. Over 1.4 million wildebeest and 200,000 zebra and gazelle migrate each year in search of rain ripened grass.